How can I plot StatData at a certain time point for a parameter when I peform a parameter scan in SimBiology? Is there an expression that I could use for this? If not how would I go about to do the things I want? I am not very adapt at using text commands for MatLab and would prefer a solution which I can use in the SimBiology module itself. indeed, you can achieve this by modifying the piece of code contained in the scan plot. Now, in the more general case where you wish to plot its value at any given time point you will have to consider two things. Let's first define t as the time point you are interested in. Press enter and you will a list that includes time points between 0 and 72 hours with an interval of 1 hour, which includes 48 hours. 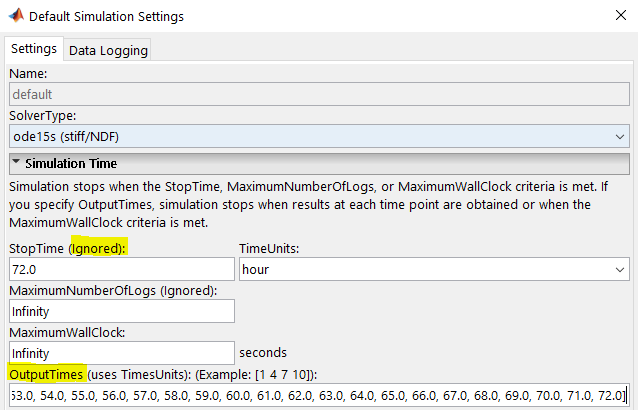 Note: Please note that in that case, the StopTime defined in the default simulation settings as well as in any task will be ignored and replaced by the last time point in the OutputTimes list. Also the live plot in that task will display the simulation results at those time points. In cases where the interval is chosen too large, some dynamics might not be recorded and displayed in the Live Plot, although they might have been captured correctly by the solver. 2. If your model contains dosing schedules and/or events that are triggered at time=t, your simulation data might include multiple data points at this time point. In this case you will need to know whether you wish to plot Ttot before or after that event. This should produce the results you are looking for. On a separate note since you mentioned that you are not very comfortable with using MATLAB command, I can highly recommend the free MATLAB OnRamp course. It is a 2 hour interactive course in the browser to learn the basics of the MATLAB programming language and get familiar with MATLAB in general. There are also more comprehensive trainings both online or onsite. An alternative solution is to resample your data. Like Jérémy explained, you will have to change the code you mentioned in your question.